When can you stop using diapers with your baby? You have a baby. Your baby wears diapers. You might want to know WHEN you can STOP using DIAPERS already. If you hate changing diapers, the cost, the waste, or you feel like your baby probably doesn't want to sit in them, there is a way OUT. Hint: It's YOUNGER than you think. WAY YOUNGER. what to dress baby in once you're done with diapers, at which ages. Really great info! My husband was always like “can we be done by 12 months” and I just look at him like he’s crazy… this confirms my thoughts: that they can be partially done, but completely potty learned night and day and for outings, it takes a bit longer. With my first, she was completely done by 21.5 months with only 2 nighttime accidents since then. My second is 7 months and I haven’t had much time over the summer to do any sort of ECing, but I want to begin soon. By the way, we live in NYC. So it was difficult for us to figure out how to go on outings without diapers for a while. My daughter is quite picky about cleanliness and smells, so as you can imagine, she needed to get use to the public bathrooms that had all ranges of cleanliness, but generally, I would try to potty her in clean facilities (hotel lobbies, anyone?). She still holds her pees if she doesn’t think it’s up to standard! That’s hilarious! Also consider the EC While Out + About minicourse. It is literally everything I know about pottying on-the-go, less than an hour long, and covers all situations with example videos, too. I was just in NYC for the 5th Ave Mile (hubs ran it) and I pottied B in all sorts of public toilets! Funny that your LO is so picky. Love it. Hey. I have an 18 month old son and we have been potty training since he was 15 months old. He can hold his bladder now and has been diaper free for two months now. I do have a hard time with him because he can go one day without any accidents and he will tell me every time he has to use the potty and it’s like a perfect day but then the next three days he’ll pee on the floor 3-5 times and never tell me once when he has to pee until he has already gone in his clothes. My question is is this normal and to be expected at 18 months even though we’ve been working on this for 3 months now or is he just be obstinate. I think this is normal. My daughter would be great at 18 months and then once in a while still pee. I think they know where they’re supposed to go, but at 18 months there are huge developmental things happening and the world is new and exciting that sometimes they forget or get too caught up in whatever they’re doing until it is too late. Give it a couple more months (and no pressure) and I think you’ll see that he will regulate more and more. I have the exact same issue with my now 21 month old. We potty trained successfully in about 2 days when she was 17 months old, day, naps and night. She was doing extremely well with very few accidents even at night. About 2 or 3 months later the accidents became more and more frequent. I had my second when she was 20 months old and the nighttime accidents started happening every day and daytime accidents increased. I think it was a combination of acting out and then not caring. I had started to wake her to pee around the times i thought she would go. This was a huge sleep disruptor and so.e nights it would take her (and us) hours to get back to sleep. Eventually it got to the point where we had to put pullups on her at night. It has been about 8 weeks now. I hate it and feel so disappointed, especially since the pullups are full in the morning. She just started sleeping through the night around 16 months, then started waking to pee, only recently went back to sleeping through the night when the pullups went back on. Help!!! Hey Taleen! Do not feel bad, lady…new baby can definitely add so much to the mix. Trust me, I’ve added a new baby 3 times now, each with various outcomes. What you need to do is stay the course. And at night I totally agree with using a backup until this passes. Did you see my blog post on that topic? http://godiaperfree.com/why-i-bought-a-package-of-size-5-diapers-3-days-ago/ Read it! You’ll feel better! Hang in there. I trainer mine at 18 month and she still had accidents once or twice a week till 24 months… it’s a learning process. But you can definitely take him more often, when you think it’s time, without him signing. That helps prevent accidents. My little one is 17 months and she’s at daycare/preschool since two months back now. At home we had mostly ditched diapers during the day (with some accidents happening) and only used diapers during naps/sleep. But she still wore diapers as a backup at preschool. Now I asked how things are going during the day when she is there and we agreed that she will only were a diaper on outings and sleep. I’m quite nervous that they will fight me on this if it goes bad but they seem sweet and havent been one bit negative towards offering her the potty so I’m hoping it will go well! At 18 months old, our daughter is diaper free during waking hours. She wears a diaper at nap time (which usually stays dry) and at night (sometimes dry). I had read some about EC around the time she was born, but she is our first and I was too overwhelmed to give it a go right away. I did start putting her on the potty around 8 months old and she would sometimes go. By 12 months, I learned a bit of rhythm with her, but life was crazy at that time and we were traveling a lot. At 17.5 months, I decided it was time and here we are, diaper free! I learned about EC when my oldest son was around 13 months old. At that time, we were all traveling around the US for my husband’s job and my son spent a lot of time in his car seat. I believed this helped as he despised sitting wet or poopy. We had a little Baby Bjorn for the car, would pull over, pop him on and then jump back on the road. At home, in Texas, he played in a shirt and leggings and enjoyed running to his little potty in the bathroom right next to our family room. Since birth, I had gotten into the habit, in stead of using wipes when we were at the hotel or home, I would plunk him into the sink (following a wet or poopy diaper) with Luke warm water and he would always pee. I would do this in the middle of the night for diaper changes as well. Maybe because of this(?) I found he stopped wetting at night and if he woke up needing to nurse, into the sink he went and viola he would pee. (I know this isn’t ideal but this was my routine and it worked for me – as well as my husband as he slept through it all). I found night time wake ups (like myself) usually meant he had to pee. He was fully out of diapers by 20 months with no accidents just in time for his sister to come along 22 months. Now my daughter was a different story. We ECed from birth with her and as a result, my husband never had to ever change my daughters diaper. We used cloth diapers as a back up, carried out little Potty With us everywhere in a little bag (the baseball park, the store, out and about). Again, this worked for us as both of our little ones didn’t like being held over the toilet to pee. They were better about the sink but not all bathrooms were private and I didn’t like holding them over the sink as to possibly gross out someone. ECing became a routine just like changing a diaper is for people. At home she wandered around with leggings and a shirt. When we were out, I wore her everywhere and the minute she started squirming or had a phantom pee, on the potty she went. I rarely used diapers by the time she was 10 months and was in tiny undies at 12 months. Success!!! I am almost in tears when you mentioned offering a pull up cloth diaper. This has been stumping me and I was ready to create one… are we talking like a fitted or an aio or what? Because drafting one in my head is keeping me up at night. Just for input, I would LOVE a pull up/down fitted that I can put under wool pants… ? I think you can use Tiny trainers under a wool cover. I haven’t tried it yet, but Andrea suggests it on her website. They are made for thin toddler, not chubby baby. So the small didn’t fit me 7 months, we use the medium and it’s still thight aroung the thighs, but it’s definitely less bulky than a cloth diaper. We used our last diaper at 7 months. It wasn’t that we were done having misses, but at that point the diaper was more of a nuisance than a help. It simply became easier to do EC with just cotton pants. I agree there, Jennifer, that the cotton pants make it a lot easier to potty a little one. I did the same thing with my eldest. It was too tough to change him! We started EC when my baby was 3 months and he is now 10 months. He quickly learned for the poops (only 5-6 misses in 7 months!) and staying dry during naps too. For the pees it’s about 50/50, but recently he had two dry days in a row! yay! I was hoping to transition to training pants around 12 months, thank you for this video that confirmed my intuition. The last diaper use for my daughter was around 20 months. She was 100% trained except for occasional misses in the car and out and about. I finally became brave and simply stopped using a diaper in the car and on outings and did two things. I reminded her she didn’t have diaper on as we got into the car. I also peed her immediately before getting into the car and immediately after we got out of the car. It worked! I think I could have done it much sooner and wish I had. My two milestones are: ditching daytime disposables at walking, and ditching nighttime disposables after those big molars come in. With both of mine, I found that they were just so out-of-whack getting those molars that they’d forget about pottying. My older has been in undies day since about 16 mo and night since 23 mo. She never slept in our room, so when I did night training, I’d go in and help her around 10pm and then again if she awoke. Our younger is 16 mo now, and she has been dry all night long whenever she sleeps in our room (even from as early as 2 mo old) because I hear her wiggle, and take her to potty. I had her dry all day long too until about 14 mo when she started teething those molars! But, I keep doing lots of laundry hoping when that fourth one comes in (please, any day now!!) she’ll start being good about daytime. I play to ditch the pullups at night around age 2 also. Your video was very encouraging and also very informative, let’s me know I’m on track with these things. Thanks! 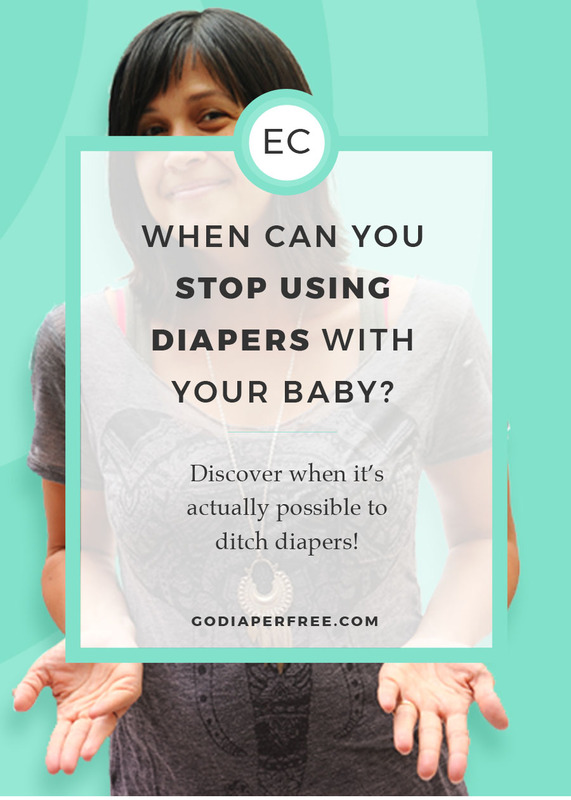 We quit using diapers at 24 months with my oldest, because I found out about EC and “early potty training” at 22 months 2 weeks before my second son’s birth, too stressful for me to try then. We had started potty training at 18 months. My second son was diaper free at 19 months and my third son was diaper free at 18 months with a lot of misses until about 20 months when he got it. Hi there! When will you be offering tiny cloth diaper pull-ups on your website to go over tiny trainers? I’m using trainers now, but would like some more protection for when we go out. Hi! My daughter started EC at 10 weeks and is nearly 7 months now. I started just before Go Diaper Free arrived by using the sink then a baby bjorn potty when it arrived. She’s doing great, holds when she can and cues when she needs to go, most times. Sometimes no cue when she’s free bum, only for wees. Basically every poo is on the potty, but she does wee several times a day, and poo too for that matter, as mostly all breastfed still. I find the pee cue similar to other annoyed sounds though. I just watched your live chat Q&A. Thank you for that. I ordered some tiny undies too. I would like to shift away from nappies progressionally. Usually give several hours nappy free a day but cloth nappy otherwise or disposable when out – if she can hold it until we get to a public restroom she will do her best, but don’t always make it depending on the journey length. Also she pees in the night what seems to be lessening and sometimes I will do night time potty EC for a wee and she’s back to sleep herself, other times may need to rock her to sleep or nurse. Would you say to keep the diaper on at night still and tiny undies with no liners or insert during the day when in and still nappy when out? I will watch video when I get a chance! Thank you love! I agree that once the child is walking, it’s a great time to switch to training pants! We switched to cloth training pants when my son was 12-months-old. This made changes while traveling much easier, since there were not always changing tables. We still used some disposable pull-on diapers, especially at night time when he was ill.
Once he turned 24 months, and we settled in one location, he switched to undies full time.